CHICAGO—Teragren, a global leader in the design and manufacturing of premium bamboo building products, and Vaughan Benz, one of the world’s leading manufacturers of high-end furniture for the hospitality industry, today announced a new partnership to create bamboo furniture for commercial applications. Vaughan Benz is now offering environmentally friendly, custom-made bamboo cabinetry, tables and seating made with FSC-certified Teragren Bamboo Panels & Veneer to the world’s finest hotels, restaurants and healthcare facilities. The partnership was announced at Greenbuild 2010, the world’s largest conference and expo dedicated to green building. Vaughan Benz’ extensive portfolio of national and international commercial clients includes well-known hospitality industry brands including Ritz Carlton, MGM Resorts International and Four Seasons Hotels and Resorts. Demand for commercial projects is anticipated to increase in the coming year: according to the McGraw Hill Construction Outlook, construction spending on “starts” for 2011 will be up 16% in commercial buildings. “Our customers are increasingly asking us to find manufacturing solutions that are environmentally sustainable, including low-VOC and FSC-certified products. 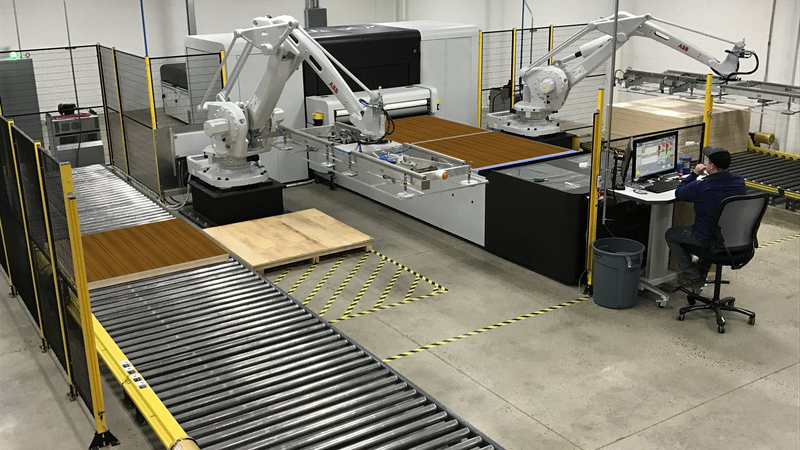 We are proud to partner with Teragren, as their leadership in providing environmentally friendly bamboo products for the woodworking industry is exemplary,” said David Benz, President of Vaughan Benz. Designers can now purchase Vaughan Benz products made with Teragren Bamboo, such as the prototype bamboo dresser featured at Teragren’s Greenbuild Booth (# L1920), or create custom designs which specify Teragren bamboo. Furniture created by Teragren and Vaughan Benz featuring Teragren’s FSC-Pure Bamboo Panels & Veneer means that certified products have been harvested in an FSC-certified forest, manufactured with 100 percent FSC-certified material and are distributed and sold through an FSC Chain of Custody (COC)-certified distribution channel. FSC-Pure certified bamboo products are eligible for LEED MR Credit 7 for Certified Wood through the U.S. Green Building Council’s Leadership in Energy and Environmental Design (LEED) program designed to encourage the global adoption of sustainable green building and development practices. Teragren products also contribute to LEED MR Credit 6 for Rapidly Renewable Materials; IEQ Credit 4.3: Low-Emitting – Flooring Systems; and IEQ Credit 4.4 Low-Emitting Materials - Composite Wood and Agrifiber Products. Teragren Bamboo Panels and Veneer are also SCS Indoor Advantage™ Gold-certified, designed to assure consumers that the products they purchase meet tough indoor air quality standards. Since pioneering the bamboo flooring industry in 1994, Teragren’s traditional and strand bamboo flooring, countertops, panels and veneer have grown in popularity as they reduce dependence upon dwindling timber resources. Teragren’s Optimum 5.5® Moso bamboo is grown in managed agricultural plots by independent farmers in China, and harvested sustainably between 5.5 to 6 years, leaving behind a thriving plant and new shoots, unlike hardwood trees which take more than 60 years to mature. Teragren supports farmers and their families by paying fair market value for raw materials and by encouraging proper stewardship of this valuable resource. In keeping with Teragren’s environmental and social mission, Teragren’s manufacturing facilities generate energy from the by-product of bamboo sawdust created during the manufacturing process. This material fuels the boilers that generate steam, powering multiple drying kilns, 90’ conveyor ovens, high capacity hot presses, caramelizing tanks, and is used to heat facility buildings. The smoke generated from the boiler is filtered with a water “scrubber” to keep most particulates from entering the atmosphere. Teragren’s factory processes its black water in its new waste water treatment facility resulting in grey water which is used for irrigation of the surrounding landscape. As a manufacturer, Teragren can guarantee the quality of its products, unlike those coming from alternate sources such as discounters, importers or trading houses in China. The company also uses materials that meet stringent Japanese, European and U.S. environmental standards. Its bamboo production is controlled from harvest to final product. A core component of Teragren’s mission is to measure, mitigate and ultimately become carbon negative. Currently, Teragren’s Washington state headquarters is carbon neutral, and carbon measurement is also underway at the company’s factories in China and throughout their product transportation system. As part of Vaughan Benz’s commitment to the environment and as a manufacturer of products made from forestry materials, Vaughan Benz is proud to be a major supporter of Orangutan Foundation International. Vaughan Benz has purchased 50 hectares of land in Borneo that is now protected habitat for endangered wild orangutans. This land would otherwise have likely been used for commercial purposes, including wood for furniture making. Teragren manufactures complete lines of traditional and strand bamboo flooring, including: Portfolio Collection (10 Designer Strand colors), Synergy™ Strand Bamboo Wide-plank Floating Floor and Synergy™ Strand Bamboo Solid-Strip Flooring (Chestnut, Wheat, Java and Brindle colors), Signature Naturals (Vertical and Flat Grains, Natural and Caramelized) and Signature Colors (Espresso, Walnut, Cherry and Charcoal) Solid Strip Bamboo Flooring; Studio Bamboo Floating Floor featuring the Välinge-patented, self-locking system; Craftsman II Bamboo Long Plank Flooring, and matching bamboo Stair Components and Flooring Accessories. The company also manufactures many styles of Bamboo Countertops and furniture-grade Bamboo Panels and Veneer for the furniture and cabinet industries. Teragren is a sponsor for the Forest Stewardship Council’s “Design & Build with FSC Marquee” for the 2010 Greenbuild Show. In 1994, Teragren pioneered the bamboo flooring, countertop, panel and veneer industry in the United States. The company is recognized as a category leader by the architectural and design communities as well as major floor covering distributors and retailers, and panel and veneer distributors. Teragren is also considered a leader within the broader sustainable business movement—it was named by Inc. Magazine as one of “The Green 50” companies that are setting the standard for environmentally friendly business, and one of the “Top Ten Greentrepreneurs” by Seattle Metropolitan Magazine. All Teragren bamboo products contribute to certification under the U.S. Green Building Council’s LEED® (Leadership in Energy & Environmental Design) rating system in four categories. Teragren’s cross-ply 100 percent bamboo core flooring substrate has U.S. and International patents-pending. Established in 1986, Vaughan Benz is one of the world’s leading manufacturers of high end furniture for the hospitality industry. Vaughan Benz is a leading supplier for international hotel four and five star hotel brands including Four Seasons Hotels and Resorts, Ritz Carlton, Peninsula, Mandarin Oriental, Park Hyatt, Westin, Hyatt Regency, Hilton, JW Marriott, Marriott, Waldorf Astoria, and nearly all of the major hotels in Las Vegas. Vaughan Benz furniture is in hotels in all the major cities of the United States and Canada as well as in hotels in many of the most important cities of Europe, Asia and the Middle East. Vaughan Benz is an industry leader for high quality, outstanding design execution, and a high level of customer service and outstanding business ethics.